Supplementary cleansing is done with Blomdahl Piercing Aftercare cleansing swabs, which are gentle on the skin. The Swabs make it possible to clean between your ears and the earrings/earring backs. Allow to airy dry. Use a new cleaning swab for each ear, each time. The Blomdahl Piercing Aftercare cleansing swabs come in a box of 24 swabs. These are great aftercare swabs. They clean well and don’t irritate my 4 month old’s earlobes. And I appreciate that I can purchase more on this website, because we ran out of the supply that the doctor’s office gave us. 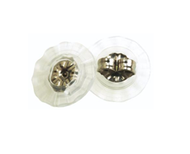 Extremely convenient and provides peace of mind that the piercing is being thoroughly cleaned. I use these on my 7 month old fairly quickly and with minimal fussiness!